Black Friday, Shop Small Saturday…be sure to bring your wallet with you to all the stuff happening this weekend! Angel Tree at Sapulpa Public Library beginning at 9 a.m. at 27 West Dewey Avenue. This Christmas be an Angel for one or more of our patrons from Bethel Manor and Bartlett Homes! Most just want socks or a blanket. All gifts are due to the library by December 15. If you can’t make it to the library, message or call Kristin Haddock at 918-224-5624 and she will see what can be done. For more information please visit the Facebook event page here. Black Friday Shopping from 12 to 6 p.m. at Vintage Rose Boutique & Flower Shop, 105 East Dewey Avenue in Sapulpa. They are will have a sidewalk sale, hot deals, and snacks! Lots of the booths are having sales as well. The Vintage Rose booth is doing 35% off the ticket price. Additionally, bring any canned food items and receive Jingle Bells Tickets! 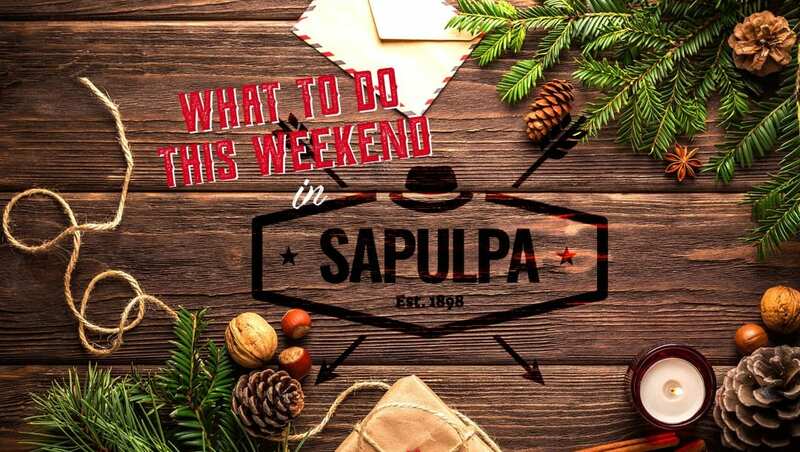 Shop Small Business Saturday from 10 a.m. to 5 p.m. in Downtown Sapulpa. Show your support for local businesses by pledging to shop in downtown on November 24th and throughout the holiday season. On the big day, enjoy special promotions and/or in store special events at participating businesses. For more information please visit the Facebook event page here. Shop Small Business Saturday Shopping from 10 a.m. to 6 p.m. at Vintage Rose Boutique & Flower Shop, 105 East Dewey Avenue in Sapulpa. They are will have a sidewalk sale, hot deals, and snacks! Lots of the booths are having sales as well. The Vintage Rose booth is doing 35% off the ticket price. Additionally, bring any canned food items and receive Jingle Bells Tickets! Grinch Painting Class at 2 p.m. at Vintage Rose Boutique and Flower Shop, 105 East Dewey Avenue in Sapulpa. Bring a friend and come join the fun paining this adorable Grinch face. The cost of the class is $28.00. Snacks, drinks, and fun will be provided! Please make reservations as class space is limited to 15 painters. Please call ‭918-224-0254‬ or 918-948-2700 to make reservations and visit the Facebook page here for more information. Sapulpa Furry Friends Fosters Adoption Event from 12 to 3 p.m. at Southern Agriculture in Tulsa Hills. This is a special adoption event to help our wonderful fosters find happiness and a “fur-ever” home. Foster pups have been fixed and vaccinated and the adoption fee is $100. For more information, please visit the Facebook event page here. ← Do you remember…Morton’s Department Store?